For the past couple of weeks my parents have been visiting in Melbourne. Most of the time, they've been staying with my uncle and aunt, further out in the suburbs, but for a few days they squeezed into my little apartment, all three of us sharing one bedroom. Was it crowded? Yes. Was it cosy? Wonderfully so. Gah, I'm getting all sentimental. Let's move on to the pictorial part of this post. While they were staying with my uncle and aunt, I visited and had some really lovely times there, too, and I took quite a few pictures. 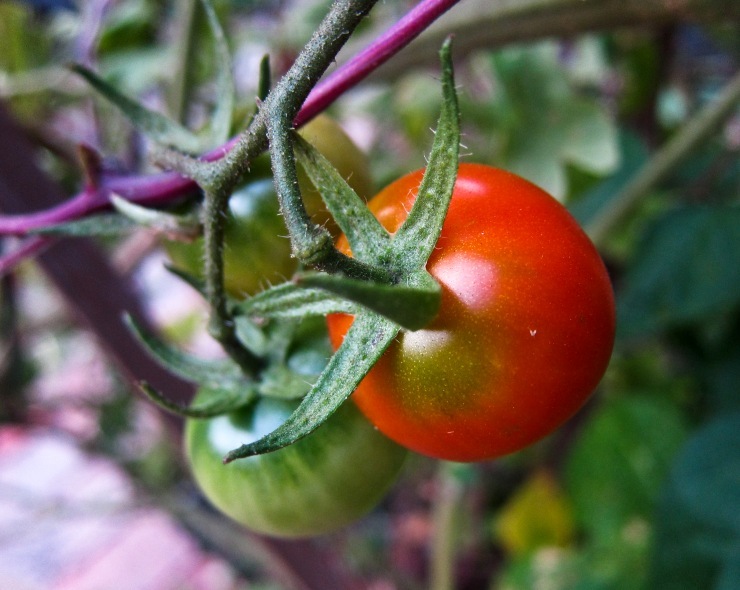 I've blogged about my uncle and aunt's awesome edible garden before so here's more of that. I guess this is sort of an early autumn edition, though the weather has been rather warm this March so you can definitely still see traces of summer. And the sweet basil is thriving. 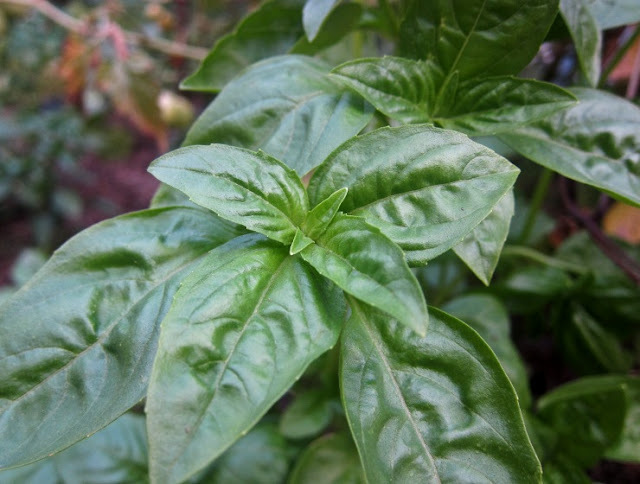 sweet basil / italian basil. Naturally, this prompted me to make a mango-fig-basil smoothie. I used mangoes from the markets and yoghurt from the shops, and, of course, the figs and basil are courtesy of the garden. Whiz it all with some water and ice, and we're good to go. 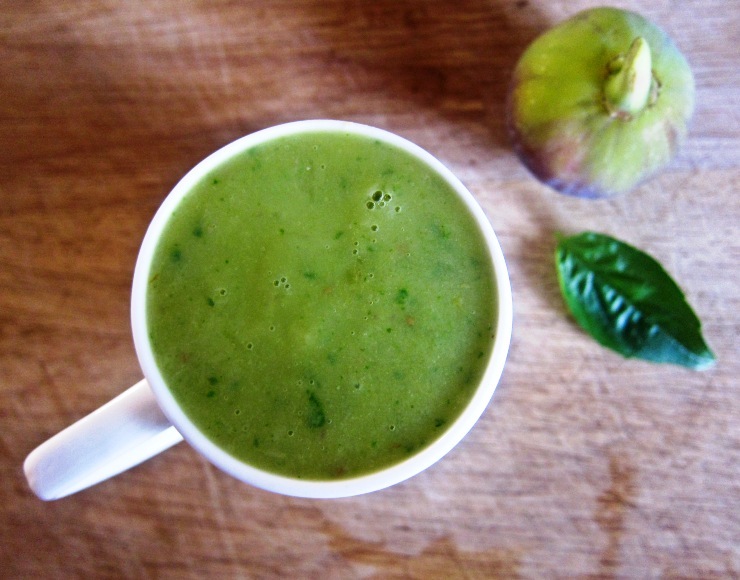 a delicious and refreshing mango fig basil smoothie. The tomatoes are juicy and sweet. 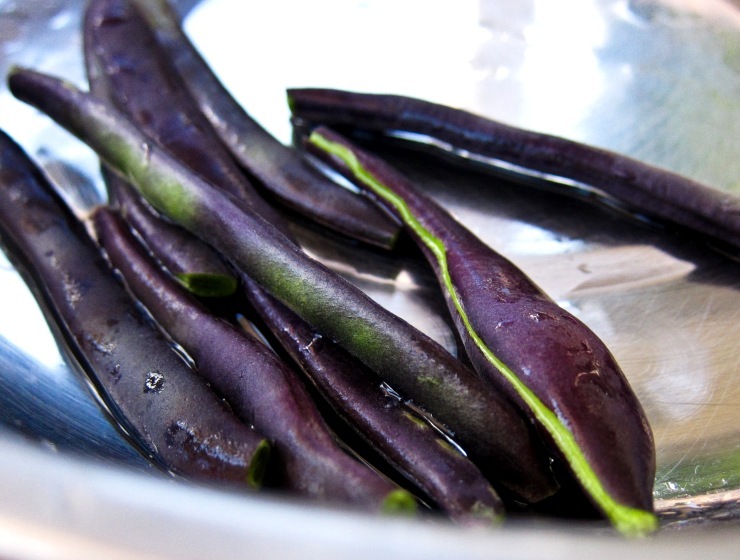 Also, purple French beans are pretty. Tasty, too. Last but not least, I absolutely adore their cat to bits. He would follow me all around the garden as I did my sight-seeing and herb-picking. 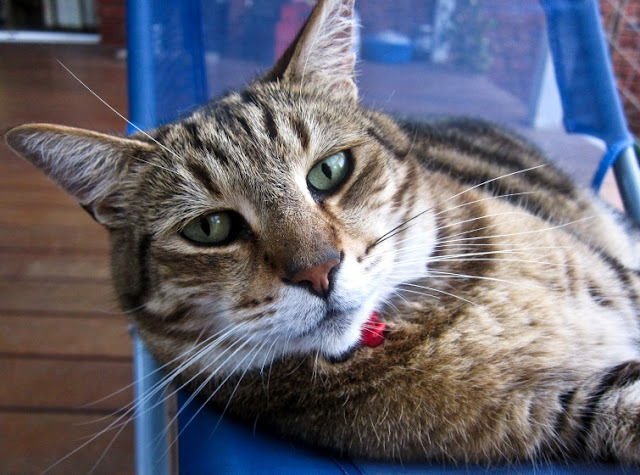 Other times, he just sits on the deck chair, like a boss. So that's pretty much my month of March so far, in a nutshell. I hope yours has been just as excellent... feel free to leave a comment letting me know about it! My month of March was eventful: been to way too many wine bars, then one week in Edinburgh, then another week planned in France... I've never travelled so much in a short amount of time. Feels good being back home though - spring has started here in the UK and with the flowers and the lush green landscapes. Thanks, it was a very tasty smoothie! They were so good. And abundant. Ahhhhh. Aw, this makes me miss my parents and figs so much. Looks like you are having a wonderful March! That smoothie sounds so good! My Tyler has gone to Melbourne for a month. You really notice the silence and I'm sure you are noticing it now. Lovely in season! Indeed, so quiet all of a sudden! Great garden shots. Love the cat. He most certainly is the boss. Sounds like you had a great time with your parents ... may they visit again soon! I know. A very sweet boss, he is. My parents have and will be continuing to visit quite frequently, which is great! aaw, sounds like you have a really cool family. I'm sure you all love to feast together! I would love a whole bag of figs .. so much fig envy! absolute envy ... i picked the last of my basil on the weekend (made pesto) and pulled out my finished tomato plants. the season is all too short here in tas! Yes, so nice to have them around! Have fun with your family! I wish I get to see mine more often, too. I love the sound of the mango, fig and basil smoothie! I love autumn produce and spending time with my folks but I don't think I can deal with sharing a small room with them, even if it's just for a short period of time. Haha! Your photos are gorgeous as always and it sounds like you have a brilliant relationship with your parents. 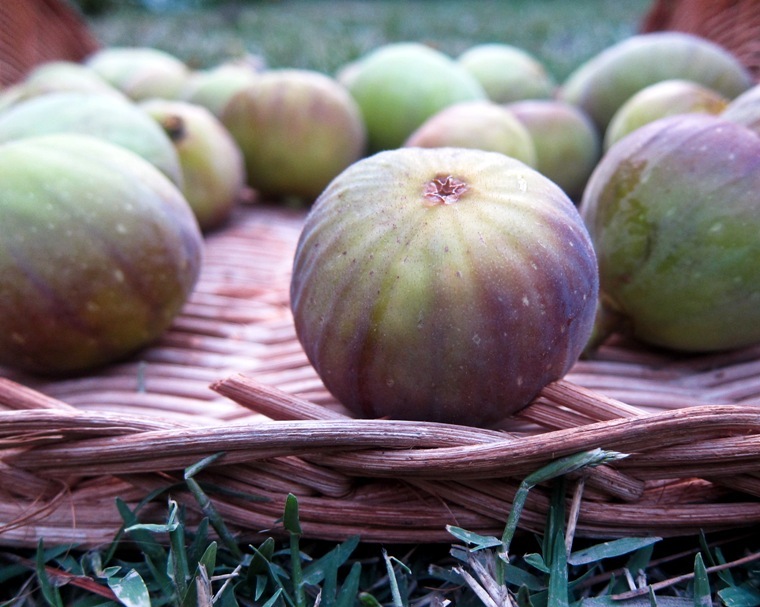 On another note, I feel a bit like a copycat because I've just written about figs and my folks too =S. But I swear I didn't copy, I actually saw your post after writing mine. We must think somewhat alike =P. Your figs look a lot better than mine though, I'd left them in the fridge and forgot about them for a while (whoops!). Loved hearing about your time spent with your parents - when mine were here last year, we did much of the same, sitting around eating and talking and walking and eating and eating and eating. So nice they came to visit! Love the garden photos as well, and of course, that cat :) Glad to hear things are going so well with you! Ooh, bossy cat, being all boss and chillin on that deck chair! I can't wait to see my kitty tomorrow:) I sure miss her during the week. I miss my family too. We're so very far away from each other. The thought of going a year between seeing them is very hard for me to come to terms with. How can time pass so quickly? I know what you mean, it would be nice to see family more often. I guess it just means that there's more to treasure when we do get together! Oh how lovely for your parents to be around, although I do live with my parents still so they can be a bit much, I do certainly appreciate having someone to talk to, meals and impromptu desserts from mum. All the produce in your photos is looking so fresh! Yummo! Heheh, I guess absence can make the heart grow fonder! I appreciate my parents' company a lot more since I left home. The produce was so wonderfully fresh from the garden. You really can tell the difference! Wow, you never cease to blow me away! What a great post - I enjoyed reading about your time with your parents and seeing your photos of what is seasonal. Awww! Smush! Figs AND catspam.